Nowadays, more and more people are using iPhone camera, it become a daily routine for mobile users. People love to record life at any moment. The birth of the child, the wedding ceremony, the travelling, etc. And also ,we live in a world of selfies, more and more people love to take photos by ourselfs. It not just because of iPhone than SLR camera more convenient to carry, but because of its remarkable performance. However, there always are unexpected scenes happening when taking photos with iPhone. Once the photos are deleted after the system updates or unintentionally by yourselves, it is a heartbreaking experience. So, if you lost photos from your iPhone (iPhone SE/6s Plus included). You only just need a professional data recovering tool to recover the deleted photos. Let me introduce a professional data recovering tool for you. Wondershare Dr.Fone for iOS is the world's 1st iPhone, iPad, and iPod touch data recovery software. It offers a full solution to recover all kinds of lost data including text messages, photos, videos, documents, call history, calendar, notes, reminder, Safari bookmark, camera roll, photo stream, whatsapp, voice memos, voice mail and more from iPhone, iPad and iPod touch. It can recover lost data from a device that has been broken, system crash, factory setting restore and ROM flashing. Besides recovering data directly from iPhone, iPad and iPod touch, it also allows you to recover data from iCloud and iTunes backup files, giving you 3 ways to get back lost or deleted files. It fully works with all iOS from old to the latest iOS 9. No matter what kind of photo you want to retrieve, Camera Roll, Photo Stream or Photo Library, Dr.Fone for iOS can help you get them back. Supports selectively scanning your iDevice and previewing deleted photos in thumbnails before recovering. This makes it possible that you can retrieve the photos you want instead of all the deleted data on your iDevice. Do you want to try? You can download the free trial version scan and check your data for free with it. And then, let me tell you how to recover deleted photos with Wondershare Dr.Fone. There are 3 ways to recover deleted photos: directly recover from iPhone, recover from an iTunes backup file and recover from iCloud backup file. Stalling the program on your computer, then run it. Then connect your iPhone to the computer. When the program detects your iPhone, follow the description in the window to "Start Scan" scanning your iPhone. When the scan stops, you can preview and check all data available to recover in the scan result. To recover photos, you can preview every item in the categories of Camera Roll, Photo Stream and App Photos. Preview them one by one, and tick the item you want. Then click on the Recover button to save them on your computer with one click. After running the program, switch to Recover from iTunes Backup File . Then the program will detect all iTunes backup files existing on your computer and present them all for your option. 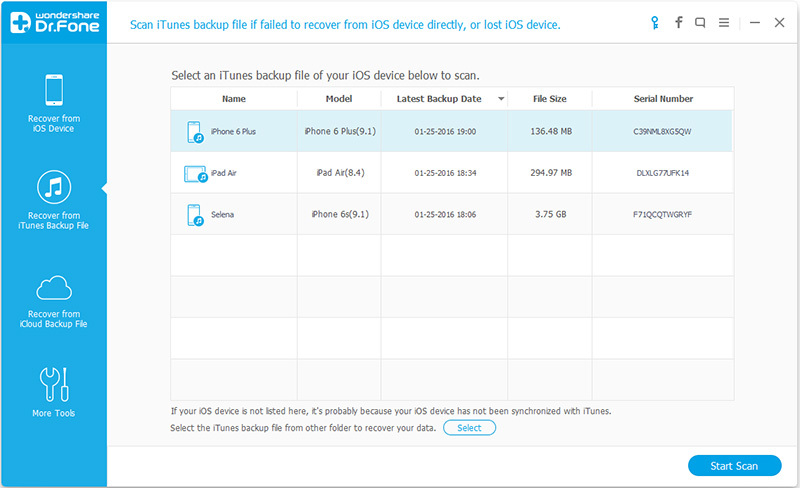 Choose the one for your iPhone and click on the Start Scan button to begin extracting the backup. The extracting process will take you about 5 seconds. In the scan result presented by Wondershare Dr.Fone for iOS, you can check all recoverable data one by one in detail, just tick the photos whatever you want during the preview. Then save them on your computer with only one mouse click on the Recover button. 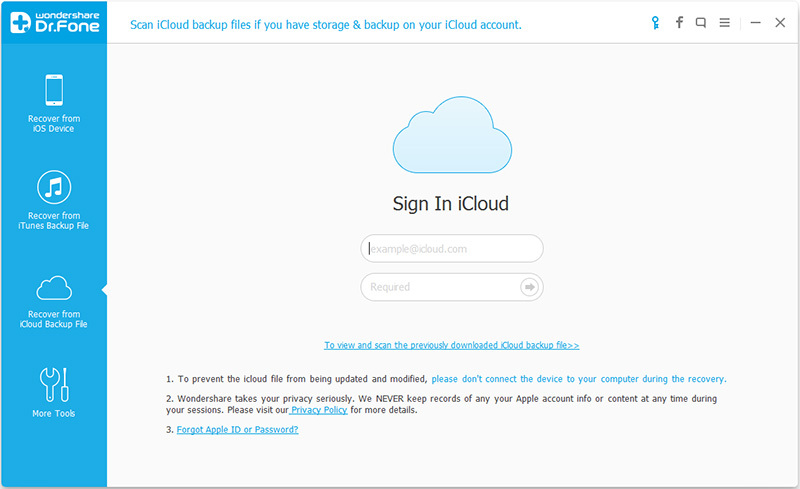 Choose the recovery mode of Recover from iCloud Backup File, and then you can enter your Apple ID and the password to log in. After that, the program can automatically find all backup files existing in your iCloud account. Choose the one you want to recover iPhone photos from to download and extract it. It will take you some time. Just wait and keep the internet connected. Once the scan is complete, you can access and preview the content in your iCloud backup in detail. For photos, you can check Camera Roll and App Photos. Preview them one by one and tick the item you want. Then click on the Recover button to save them on your computer. How to Recover Voicemail from iPhone/iPad/iPod touch?